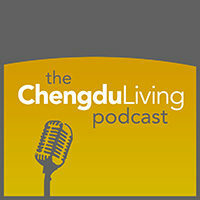 When you’ve been living in China for a few years, you take things for granted. Like the innumerable bizarre items that you pass in the supermarket that you can’t identify, but don’t really think about. 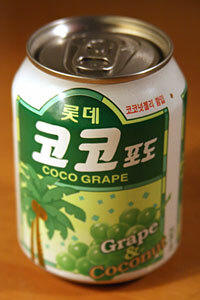 The first thing that struck me about Coco Grape was the size of the can. Its diminutive size made it stand apart from others on the the pseudo-fruit drink shelf. There were many colorful cans on the shelf and at first I hesitated with my hand hovering above strawberry-something juice before I decided to go with Coco Grape. After opening the can and taking a sip, it turned out to be half liquid, half solid: grape juice with coconuts chunks floating around in it. It’s not bad. The sweetness of the coconut stands in stark contrast to the slightly sour grape juice. Neither I nor Huyi can read the label because it’s written in Korean, so we can only guess if the grape juice is really grape juice. “Grape & Coconut” printed on the front of the can pretty much sums it up, though. The chunks are a bit disorienting for me, but this isn’t the first time I’ve enjoyed a fruit-chunked beverage and Coco Grape sounds cool. This item struck me from the impulse aisle near the cash register because it’s bold, bright red, and contains English. Also, it’s named “Astick” and shows chocolate being poured into what looks like a straw. I couldn’t help but imagine that it’s a Chinglish-bearing Pocky (Japanese snack) ripoff, but actually it’s imported from Indonesia and the taste is different. 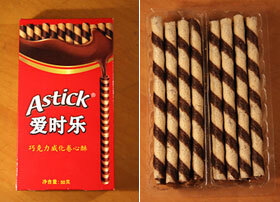 The outside is crispy and the inside of “Astick” is filled with creamy chocolate. Pretty damn tasty. Astick’s Chinese name (???) means “Love time happy” so the name is gibberish in two languages. The packaging for the Dried Beef Bag is a curious denim pouch that’s sealed shut — unique among the various other hanging beef snacks. On the outside it says “I’m natural, you are happy” (???????) and includes a tag which indicates that it’s the most delicious dried beef you’ve ever had. We ceremoniously open the mysterious pouch to find a clear plastic bag within it that holds about ten of these small beef snacks, all individually wrapped. The actual meat is very small, slightly sweet, and soft. As I’m trying to figure out what occasion would warrant the purchase of a dried beef pouch, Huyi points out that a mutual friend used to carry this exact pouch around as an ironic wallet. I found this in the bulk candy section amidst a host of other love-themed candies. The character imprinted on the front of the wrapped is Xi, a Tang Dynasty tradition that symbolizes happiness and prosperity, usually in conjunction with a marriage. If you look closely, you can see that the character includes a pair of hearts in the design. Slightly larger than a Mentos, the outside of Double Happiness is powdered sugar and the inside is creamy filling that comes in strawberry and lemon. These two flavors strike me as similar to Jolly Ranchers – pretty delicious. With “Mother” (??) and the image of a 1950’s US housewife on the front of the packaging, this must appear to Chinese people to be what we (foreigners) have been eating since we were children. 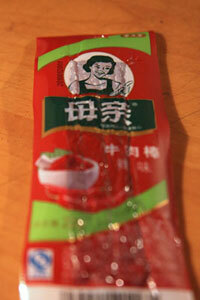 And actually, aside from including Sichuan spices, this doesn’t taste too dissimilar from beef jerky I’ve had overseas. 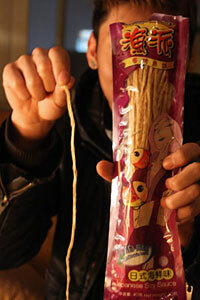 Basically, it is beef jerky, although here it’s called a beef stick (???). The strip of meat is small and when our eyes meat as we’re chewing furiously, I can sense that this is unfamiliar for Huyi. Of all the items on this list, this is the least alien to me. Ahh, Fragrant Barbeque Fish Strips. At first glance I couldn’t even tell what this was. With it’s long and thin shape it looked like a package of spaghetti transformed into a snack, but as soon as you open the package you can be sure that yes, it’s definitely fish. This one actually included some English on the front: “Japanese Soy Sauce Flavor”, and “High Protein, Low Fat”. The strips of fish are cut very thin and are heavily seasoned, like a rubbery string that tastes like like fishy soy sauce. Unless you fold it and put it on your mouth (weirdo), it hangs out of your mouth by about eight inches, making you look like a cowboy chewing on hay. How weird do these seem to you? 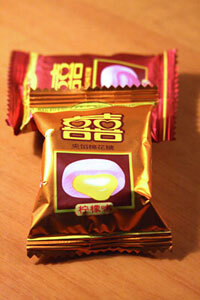 If you’ve had the pleasure of trying these or other weird snacks, let us know! Awesome photos. That last one is very odd. Weirdest thing I’ve ever found in a Chinese supermarket: whole dried jellyfish. Or hairy meat. I saw hairy meat when I was at the supermarket last night. It’s actually Chinese traditional medicine mixed with different meat products. I don’t know much more about it than that! It’s pretty strange looking. I LOVED the beef jerky. I don’t know if you noticed, but there are a couple different flavors and all of them are quite edible. If you don’t have access to good beef jerky, I don’t think it was a bad substitute! Someday soon I think I’ll do a follow-up article to this detailing a few weird things you’ll only find in a Xinjiang supermarket. Thanks for the idea. Different flavors of the Mother brand? Or another beef jerky brand? I saw a column of those Mother’s near the checkout. Kinda expensive but not bad! The one I had was real spicy. Yea, it was different flavors of the Mother brand. I think I saw three. The one I preferred (not the one in the picture) was like a pepper steak seasoning. But as you said, it was kinda expensive. 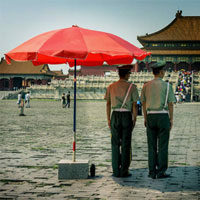 In our city a single stick was about 6-7RMB. For Weird Chinese Supermarket Drink #1, I nominate 啤儿茶爽 which is a combination of slightly sweet green tea and beer. Should be available in all major supermarkets. Actually it doesn’t taste as bad as it sounds. Thanks for the tip VL, I will look for that! Green tea and beer will be new for me – sometimes in the summer I’ll drink the pineapple beer in a can drink. Refreshing and intoxicating! I love some of the the Mother’s beef jerky products, especially the Thai spice one. Sadly it can be hard to find, but can sometimes be found in the larger supermarkets like Auchan. I’m not such a fan of the Mother’s breakfast sausage though. It’s kind of an egg flavoured beef jerky – yuk!